Explanation: Will Phoenix survive its landing today on Mars? Phoenix's landing sequence will ramp up starting at about 7:30 pm EDT (23:30 UTC) today and last just over an hour. If all goes well, one of Phoenix's first images from Mars will appear on APOD tomorrow. The Phoenix Lander is programmed to set down near the North Pole of Mars, and, over the next three months, sample alien soil and ice and look for conditions conducive for ancient microbial life. 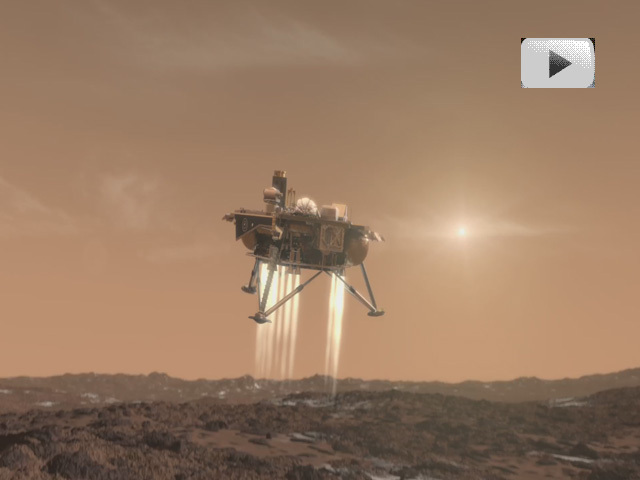 Shown above is an artistic animation of what it might look like to see Phoenix land on Mars. In the animated sequence, the Phoenix spacecraft arrives at Mars, deploys its braking parachute, jettisons its heat shield, fires it thrusters, lands, unfurls its solar panels, deploys its instruments, scoops up some of Mars, and begins its analysis.